A knock on the door startled her. Ms Anne seldom got any visitors; not many people lived in the vicinity. Having faced the ebbs and flows of her life with equal exuberance, she decided to live in a house—away from the typical chaos of life—like the one in a painting she made during her teens. The stream flowing nearby provided refuge from the long, hot days. It had its own share of highs and lows, grazing the bed at times and running over the big boulders in its way at others. The wooden bridge across the channel had become fragile of late and made funny noises when somebody passed over it. The trees stood there leafless, naked—exposing their bare branches to the punishing rays of the sun in a hope that the sun will soon be imprisoned beneath a layer of dark, grey clouds. “Ms Anne?” the delivery boy inquired. Dear Anne, if you’re reading this letter then I am probably taking a long nap in my grave. I once promised you that I’ll visit you, decades later when we would’ve grown old. I grew that old a few years back and have been thinking of visiting you ever since. I almost showed up at your place on three occasions but a strange misgiving haunted me and prevented me from knocking. The fear that you might actually not remember me; it had been a period of more than 50 years after all. Each time, I turned back and went away, went away and chose to live with a false hope that maybe, maybe you remember me than to knock on the door and know for sure. It’s better to live in an expectation of a win than to figure out that you lost. Please open the box before you read any further. She opened the box with her frail hands. It contained a wind-chime which tinkled when she took it out. It was the most melodious sound she had ever heard. 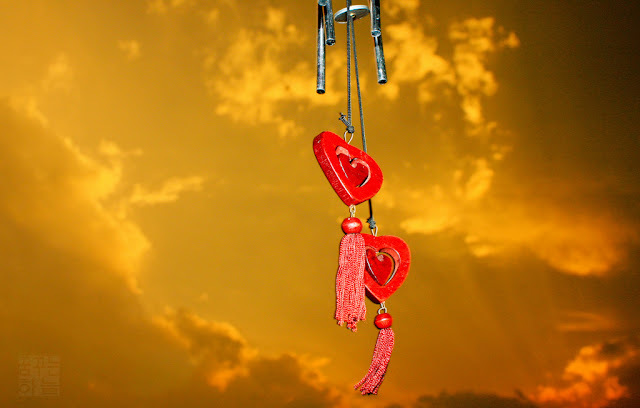 You once said that you’ll never purchase a wind-chime for yourself but will always want it as a gift because when bought for yourself it’s just a melody but when given by someone it’s a memoir which will remind us of that person with every clink. I hope that you’ve not been given ‘your wind-chime’ yet. Now that I’m away from your world and in an unconscious sleep I have no issues in letting you know all of this and if I even have a speck of cognizance, I’m hoping that you do remember me. Tears began to run down her cheeks, she was overwhelmed. “Why didn’t you knock?” She whispered. She went to the porch and hanged the wind-chime near the entrance. A faint breeze began to play with the tubes of the wind-chime. “Wind-chimes attract benevolent spirits,” she once read. She knew he was near.